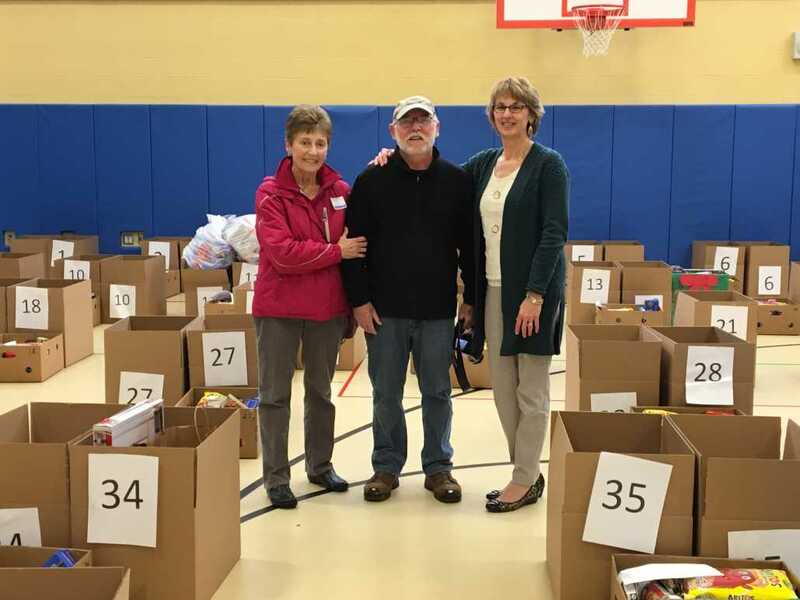 It was a busy week for Rotary members as we helped with the distribution of food, turkey vouchers, toys and gift cards for which Rotary donated funds. 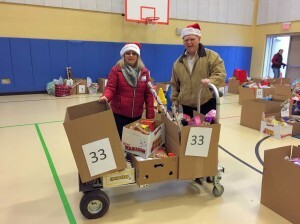 All of these items were added to other gifts donated by school families and community members. 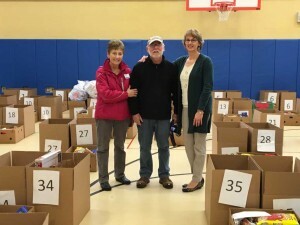 Rotary worked with Lisa Meunier, school nurse at Burgess, who identified 41 Burgess families (impacting 150 individuals) going through difficult times this Christmas. 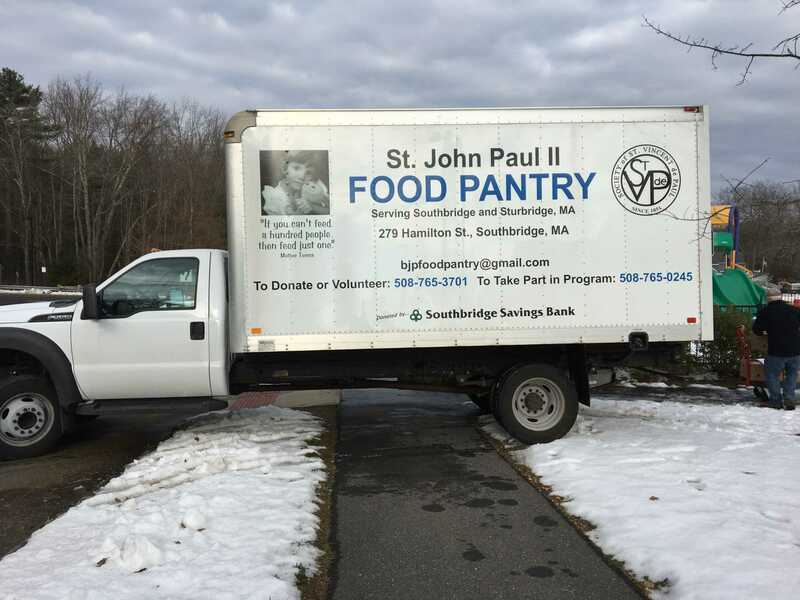 The John Paul II Food Pantry delivered the 41 boxes of food on Tuesday and the rest of the items donated were added to the boxes. 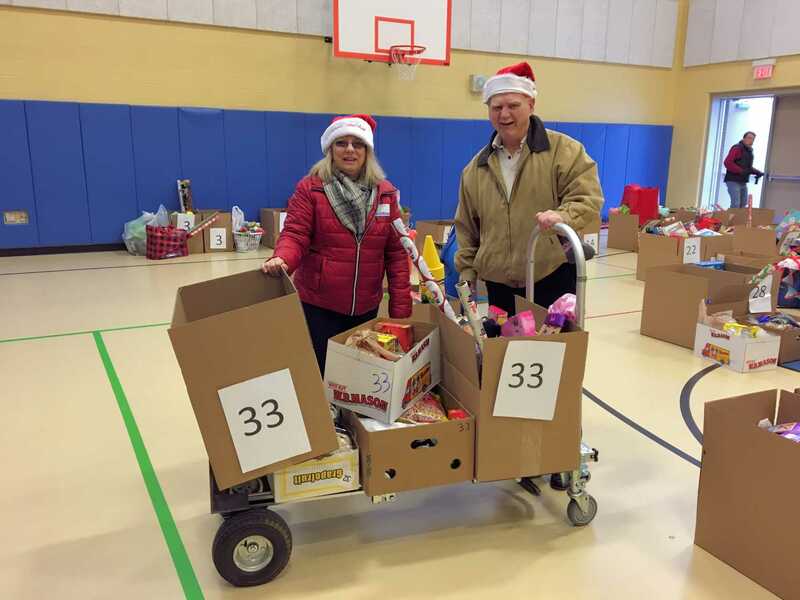 On Thursday, Rotarians and Burgess staff members helped deliver the boxes to the cars of the recipients. 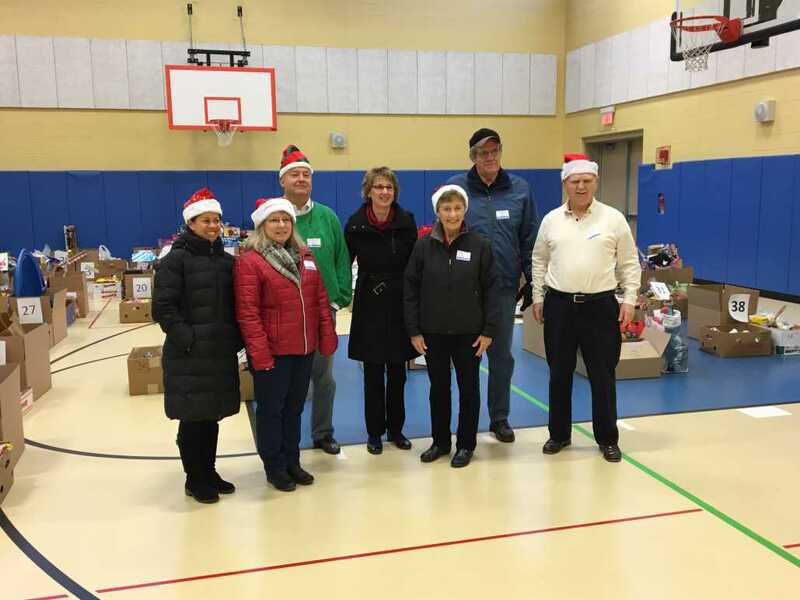 To witness the thankfulness of the recipients was very rewarding as well as emotional for us. 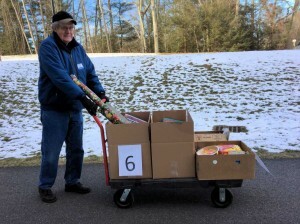 While we have given this donation previously, this was our first year with hands-on delivery of the food, cards and gifts. 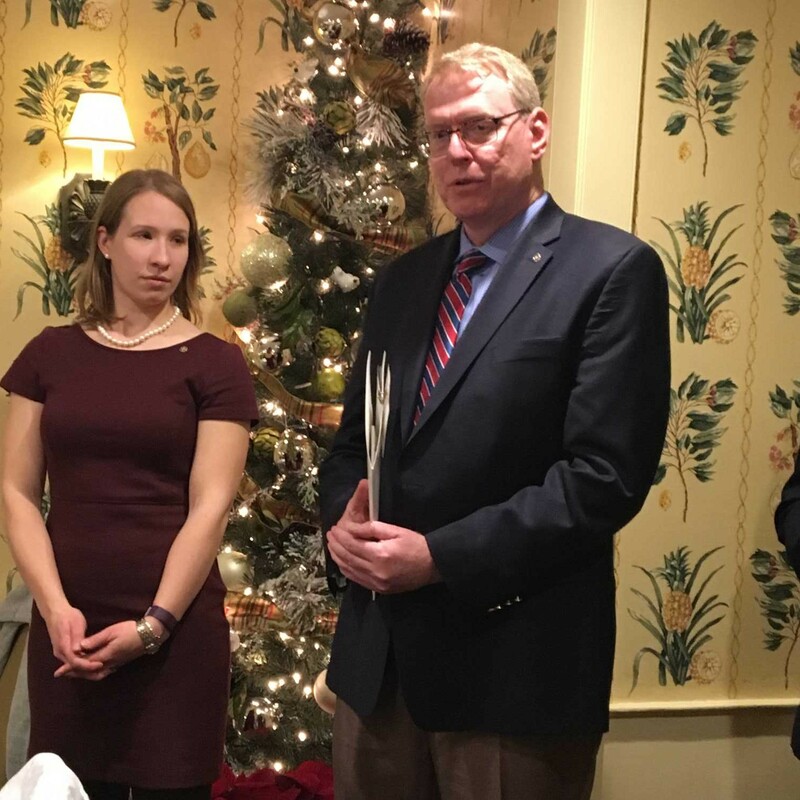 Our efforts were openly appreciated and it gave us a much closer look at the impact of our humanitarian work as Rotarians. We went home cold and tired but with a smile on our faces and a feeling of great satisfaction. 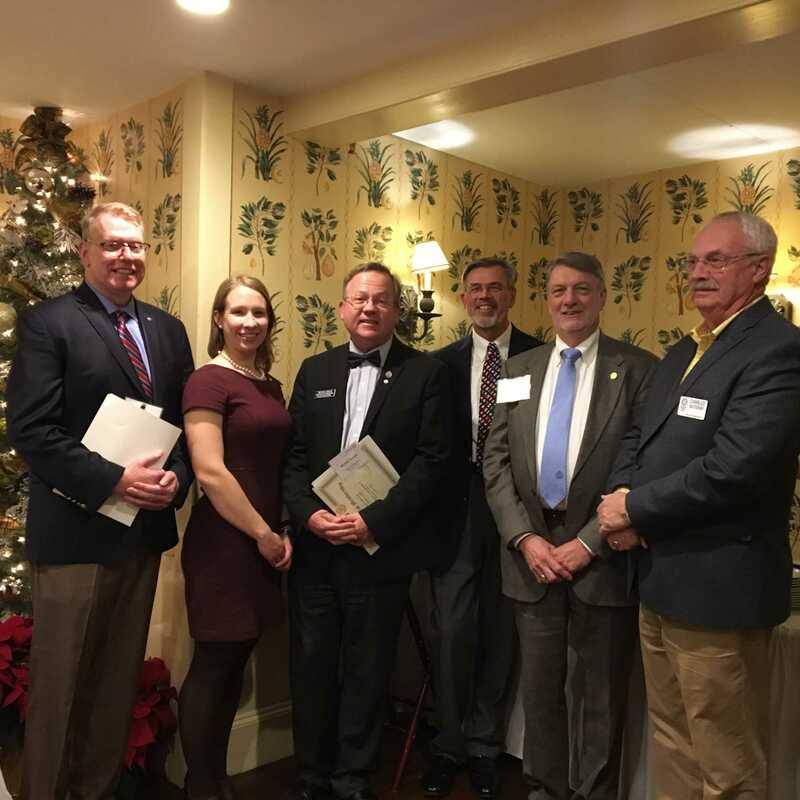 Sturbridge Rotary recently inducted three new members from Old Sturbridge Village (OSV). The Village is the third Corporate Membership to join Sturbridge Rotary since Rotary International introduced the Corporate Membership category. The three new members installed are Jim Donahue, President and CEO; Anne McBride, Director of Development; and Michael Arnum, Director of Marketing and Public Relations. OSV depicts life in an early 19th-century rural Village, featuring costumed historians, antique buildings, water-powered mills and a working farm. The Village plays a vital role in preserving early American history and has been an iconic New England destination since 1946. 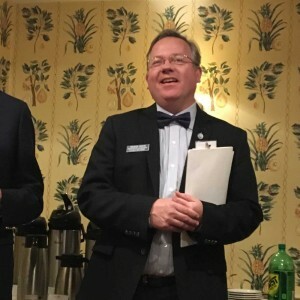 The induction ceremony was led by both Past District Governors Carl Kaliszewski and Klaus Hachfeld and the new members’ sponsor, Charles Battersby. Past-President Otto Prohaska welcomed the new members to Rotary as we all look forward to continuing our mission locally, regionally and internationally. Sturbridge Postmaster Jennifer Drago spoke with us about the structure of the postal system, the updates and challenges faced system-wide as well as locally by all post offices. 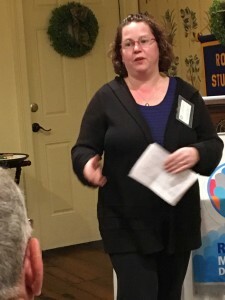 She also shared a few delivery tips. 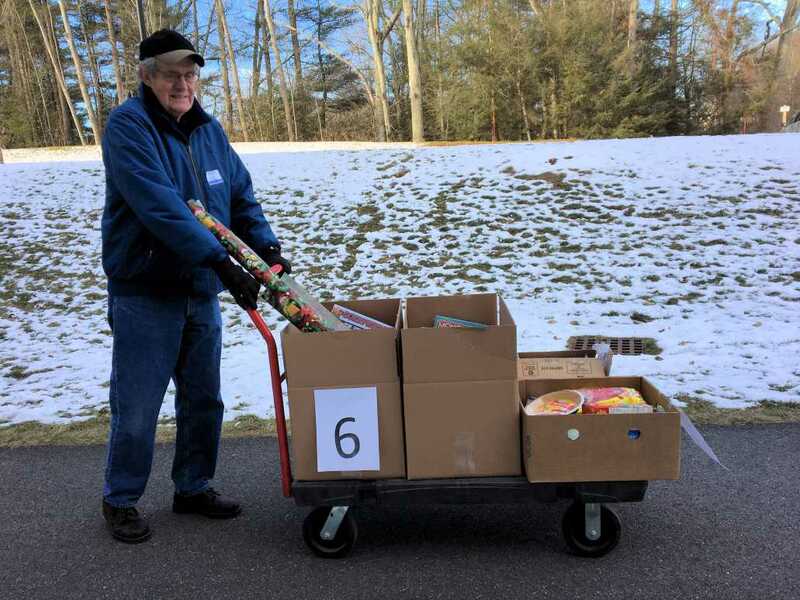 Want your Sturbridge mail to be delivered the next day? 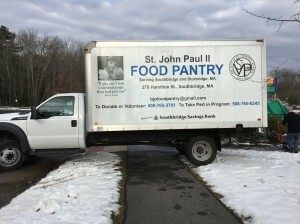 Put it in the Sturbridge mail slot inside the post office versus in the outside box. 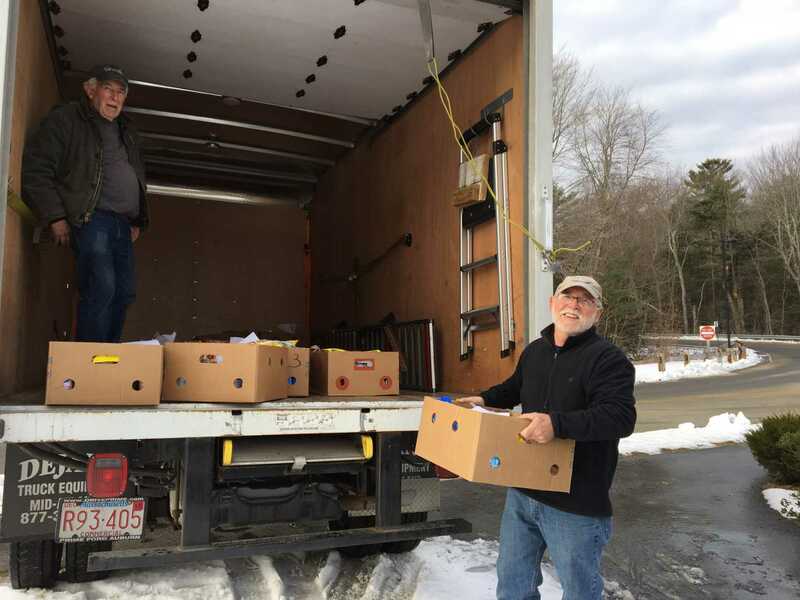 Contents of the outside box go to Boston to be cancelled, then to Shrewsbury to be sorted, and back to Sturbridge to be delivered. When all was said, we all agreed that Sturbridge gets excellent service with minimum complaints! 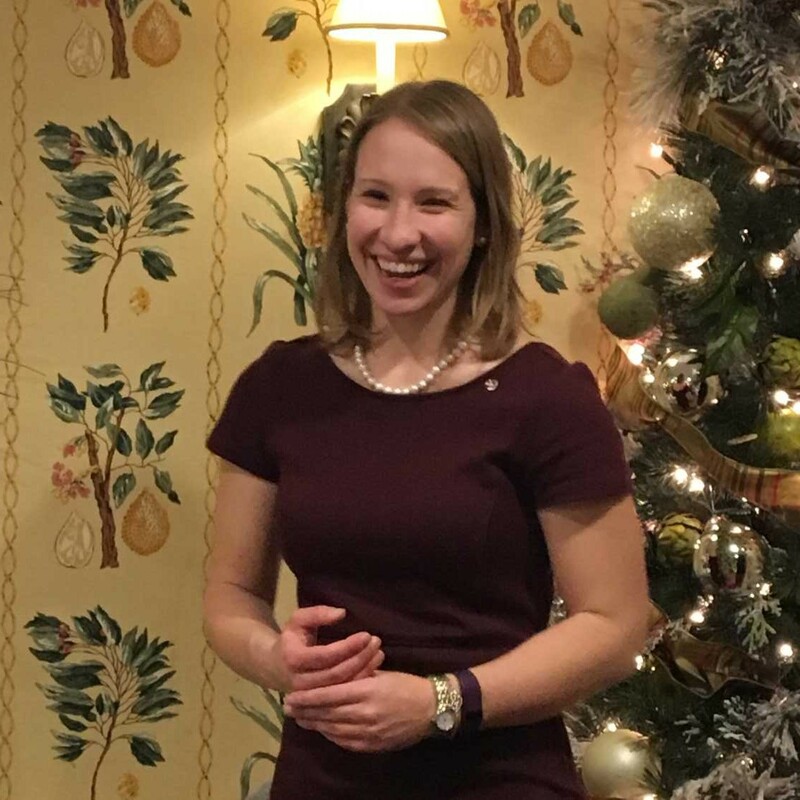 Congratulations Jennifer and we’re glad you’re at the helm of the Sturbridge Post Office. Thanks for all your hard work! 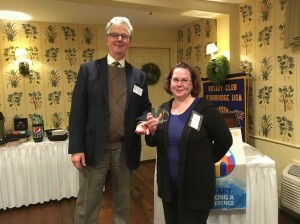 Past President Otto presenting a Rotary mug to Postmaster Jennifer. 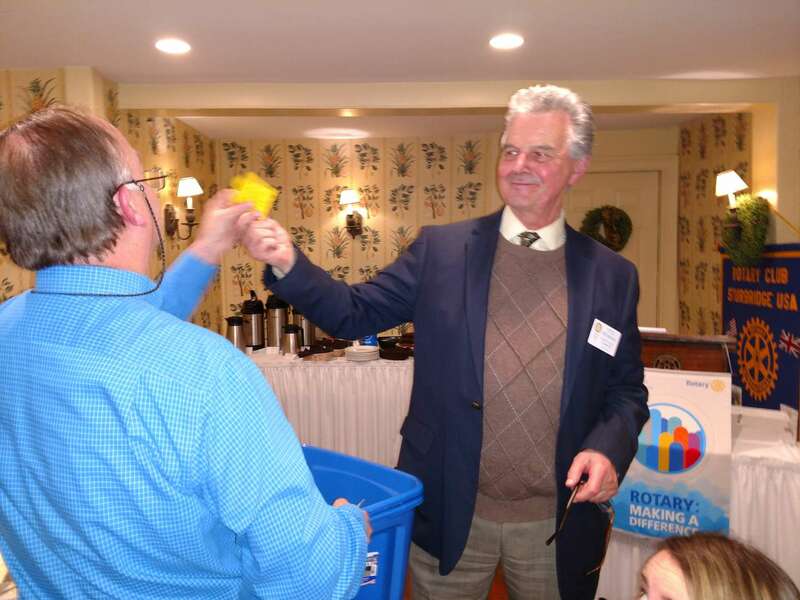 The winning ticket was drawn at the Rotary meeting last night for the Lottery Basket with $1,000 worth of lottery tickets. 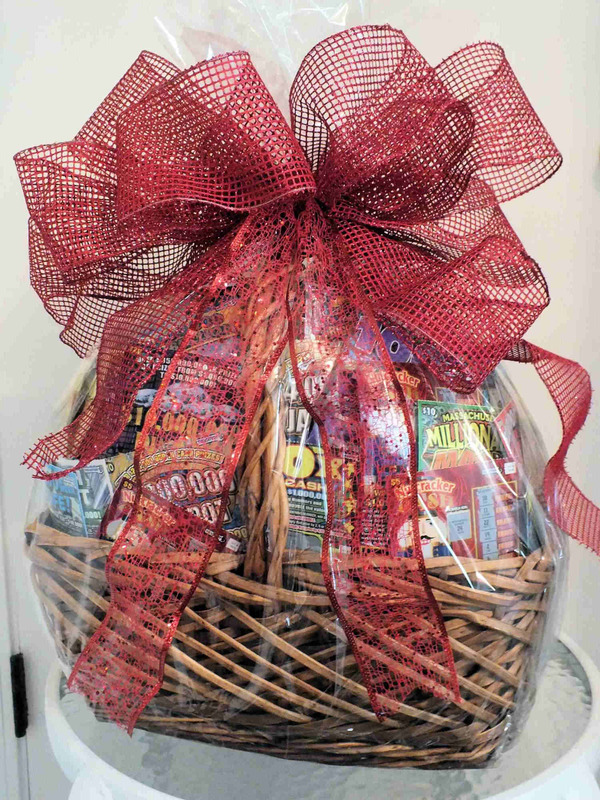 The winning ticket number is 730 and was purchased by a gentleman from Spencer, MA. He has been invited to an upcoming meeting so we can meet him. Congratulations #730 winner! Our thanks go to each and every person who bought a ticket for this fundraiser. We can’t do this without your support. The proceeds from this fundraiser go primarily to fund the $6,000 in scholarships that Sturbridge Rotary awards to Tantasqua Regional High School seniors who are pursuing a college education. To date, Sturbridge Rotary has donated over $194,000 for local scholarships. 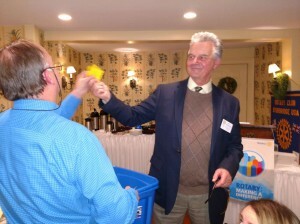 PP Otto pulls the winning ticket stub from a tub of 1,000 tickets sold. Sturbridge Rotary President David Zonia is shown presenting the Annual Thanksgiving Day trophy to Tantasqua’s head coach Jon Hargis after the game against the Shepherd Hill Rams. Presenting the trophy to the winning team has been a tradition of Sturbridge Rotary for the last six years, however, this is the first year that the trophy was presented right after the game was played. This is also the first time Tantasqua has won since 2008. 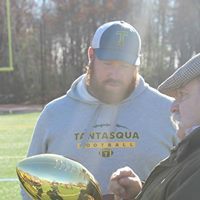 The trophy will be engraved with Tantasqua’s name and the game score of 32 to 15. Tantasqua will hold the trophy for a year and return it to be presented to the winner next year. Congratulations to Jon and his team of Warriors!